The Ford Windstar's first year of production was in 1995. This family-orientated minivan replaced the Aerostar. Your choice for purchasing a used Ford Windstar will be within two generations of models offered. Your best bet would be the latter grouping which includes models from 1999 to 2003. This more recent age group contained many upgrades not present from 1995 to 1998. Some of the changes included the second and third row of seats being more maneuverable on rollers and a rear sliding door was added to the drivers side of the vehicle. 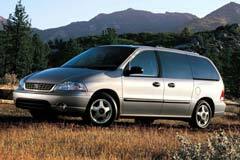 Used Ford Windstar's may be available in one of five models. These are the base version, along with the Limited, SEL, SE and LX editions. Standard equipment included dual air bags and anti-lock brakes. After 1998 there were 2 engine offerings: a 3.0 liter 150 horsepower V6 or a 3.8 liter 200 horsepower V6. The 3.8 liter became standard in 2001. Both engines were paired with a 4-speed automatic transmission and front wheel drive. While a used Ford Windstar may not be as reliable as counterparts offered by Honda and Toyota at the time, safety was the essence of the Windstar. That alone makes it a very sensible choice, especially for families. 1998 Dodge Caravan SE VAN HANDICAP WHEELCHAIR ACCESS RAMP SMOKE FREE! 1998 DODGE CARAVAN VAN HANDICAP WHEELCHAIR ACCESS RAMP NON SMOKER NO RESERVE!! !